Combine chorizo and pork in a medium bowl with your hands. Take about 2 Tablespoons of meat and wrap around a single Gusher making a meatball the size of a walnut. Repeat, making remaining meatballs in the same manner. Heat oil in a small pot and fry meatballs in batches for 3-4 minutes or until meatballs are brown and done. Drain on paper towels. How adventurous are you when it comes to trying new foods? 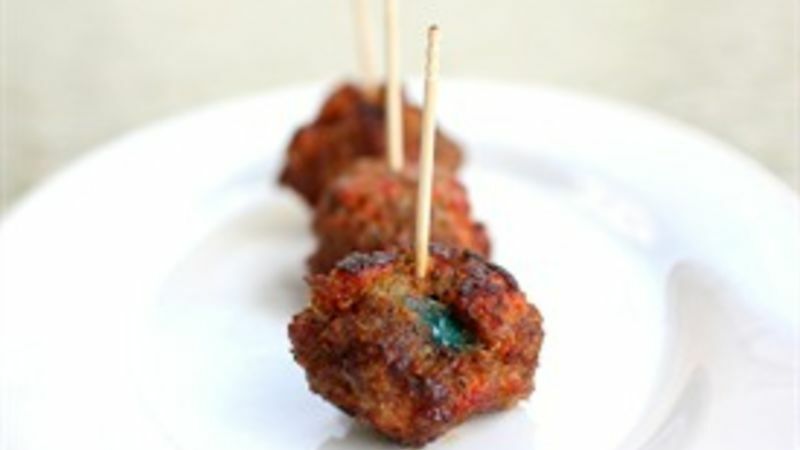 When I first thought about these Chorizo Spicy Meatballs with Gushers, I admit I thought…um…disgusting. But the more I thought about it, my mind opened up to the possibility that it could be amazing. I love meatballs and I love Gushers…so why not together? After all, I really enjoy a spicy and sweet combo when it comes to food. In fact, some of my favorite meatballs are my 3-Ingredient Slow Cooker Meatballs made from grape jelly and chili sauce. So really, a meatball stuffed with a gooey fruit candy isn’t that far off. These meatballs are super simple and can be assembled and ready to eat in under fifteen minutes. Chorizo has great spicy flavor all in itself, and paired with a sweet surprise inside? It’s the perfect complement. When the meatball is cooked, the Gusher inside becomes soft and less definitive as a candy. It tastes more just like a sweet sauce tucked inside the meatball. Just throw caution to the wind and give these babies a try. Even if you aren’t a fan they will definitely be a great conversation starter at your get together. But chances are…you will love this unique combination just as much as I did!